I'll never eat real egg salad again! With one pound of tofu, this made enough to last me for a week without going bad. I tried to squeeze as much water out of the tofu as I crumbled it, for fear of it getting watery later, but the texture was great and remained in tact. The mayo-mustard-relish combo could fool any non-tofu eater, and it gives that sweet, tangy flavor that's typical of egg or tuna salad. Celery and green onions gave this a nice crunch and bursts of flavor. I liked this on top of a crisp cracker, as it gave a nice contrast to the tofu softness. I think this would also be good on toasted bread. 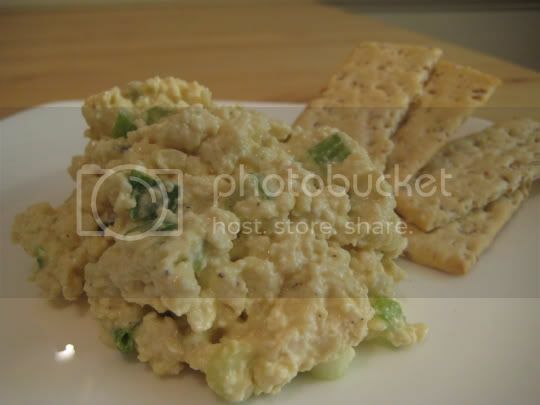 "Tofu 'Egg' Salad," The Vegetarian Meat and Potatoes Cookbook, Robin Robertson. Boston: Harvard Common Press, 2002.